This year is all about Glowing Skin! I mean what year is not about glowing skin???? 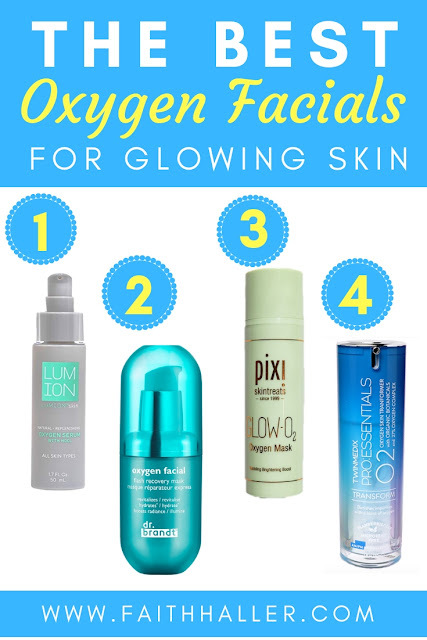 Glowing skin is always in and you can definitely achieve it without using tons of highlighters & makeup and one of the quickest ways to achieve that is through an oxygen facial. Your expression lines are less prominent because the oxygen treatment will plump the skin. A deep infusion of oxygenated vitamins & antioxidants to protect the skin from sun damage that can age the skin. This treatment is non-invasive. So you can carry on with your regular schedule, you can wear makeup. It naturally exfoliates the skin so you will notice the clarity of the skin is healthier and the skin is brighter and radiant. So now that we got that out of the way I am going to share just 5 At-Home oxygen treatments that do all of the amazing things that I listed above! On the Think Dirty App Lumion Skin Oxygen Serum is rated a 0 which is the cleanest product to put on your skin. This Serum is an effective yet lightweight serum that defends the skin against... Signs of aging, soften fine lines, and aids in the reduction of skin irritations. This product mimics the body's natural immune defense system and contains HOCL that softens, hydrates, clarifies, purifies and illuminates. And through the oxygen, it promotes skin cell turnover. Give your skin a breath of fresh air through Dr. Brandt oxygen mask. This mask instantly foams up into bubbles and detoxify, purify, and hydrates the skin leaving it soft, supple, and radiant. If you are looking for a more affordable This oxygen treatment mask revives dull, tired skin, providing an immediate anti-fatigue effect –perfect before a big event or makeup application. Twinmedix Oxygen Skin Transformer is a pro favorite! This mask releases oxygen into the skin so your complexion instantly looks fresher and brighter. This formula is rich in antioxidants to fight free radicals that agest the skin, and cleanses deep into pores while removing dirt and all impurities. Moisturizing botanical extracts combats the appearance of age spots and visibly repairs premature aging. This mask is designed to clear skin and maintain a healthy and youthful glow.